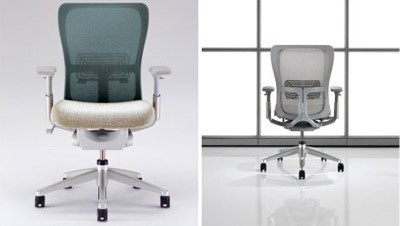 Mindful Design Consulting Newsletter (April 2010) How to Choose Your Office Chair. This is our April 2010 design newsletter. Today I would like to remind you to take care of your health at your work place. It is so easy to forget that our well being is very much related to the environment surrounding us as well as to the furniture we are using. In our Green News corner, learn how to choose a paint color that does not emit any harmful chemicals, called VOCs. VOCs have been linked in scientific studies to bad health outcomes, including eye, nose and throat irritation, nausea, headaches and even cancer. Have you ever thought how to increase the productivity of your company or even your own motivation on a daily basis while sitting at your office? Take a look around! Are you surrounded by a pleasing environment? Do you want to be spending most of your life in what you see right now? Are you comfortable? While briefly touching up on some of the aspects of an office design, I'd like to focus your attention on the importance of good posture while doing work. 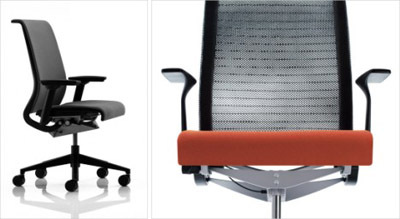 Read below some simple guidelines on how to select the best office chair for YOU. When designers think about a comfortable office environment, we usually take into consideration such elements as: 1) Physical comfort - the quality of light, temperature, sound and ergonomics; 2) Functional comfort - the ability of workers to interact effectively with the environment they are in; 3) Psychological comfort - which effects our mood, cognitive function, and believe it or not, feeling of loyalty and commitment to the company you work for. Mindful Design Consulting design team looks at all these elements as a whole in the process of design. But today I would like to center your attention on the Physical comfort of your personal work station at work or your home office. What do we do every day? We sit. We sit in the office and at home, driving a car or watching a movie. All day we are sitting and staring at our computer screens while moving nothing but our fingers. We get stiff and tired, we get neck and back pains. Because constant sitting is bad for you it is a good idea to get the most comfortable chair for your work or home office. 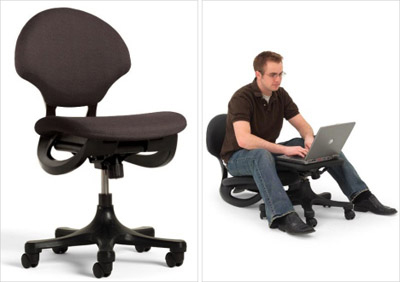 Several furniture companies design chairs specifically for people who work long hours at computers. When shopping for a chair, test several chairs as if you were buying a car. Sit on them and try to adjust them to your body before you make your final decision. Follow these other guidelines listed below. Your new chair should provide adequate back support. The back support of the chair should also be adjustable to fit properly to your back. The back support of the chair should remain the same as you move and recline in your chair. A good office chair with proper back support will improve your posture and therefore eliminate or reduce back pain and stiffness. Herman Miller's office chair - Embody. One of the most ergonomically designed chairs of our time. Read more on the company's research and design process HERE. The padding and design of the seat should be considered. The front of the seat should have a rounded edge. A straight horizontal front will cut off circulation on the backside of the knees. A good tip is that you should be able to slide your fingers between the inside of legs and the front edge of the seat. Also, look at the fabric of the seat. 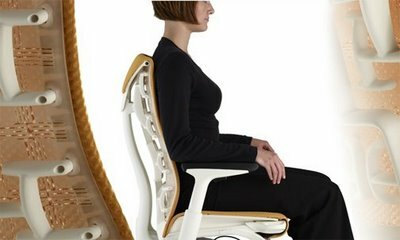 It should allow your body to breath through during long hours while seated. Think - Chair by Steelcase. The first product to ever receive Cradle-to-Cradle certification from MBDC. High wear parts like casters are replaceable, so one broken piece doesn't mean you have buy a whole new chair. Smart! You need to fit into the chair. If you have to squeeze into the chair then it does not fit, no matter how comfortable it may seem once you are seated. There should be room between the armrests and your body. In addition, the armrests need to interact with the desk. A good office chair will have adjustable armrests. What good are armrests if they are not useable or uncomfortable to use? Quality armrests can help with tasks like reading and writing, and taking pressure and tension off the neck and shoulders. Zody - Chair by Haworth. Zody is the first chair endorsed by the American Physical Therapy Association. Ergonomic standards and guidelines recommend several working postures - sitting while reclining, upright, or in forward tilt; standing or alternating between sitting and standing. This ergonomic chair allows users to sit in these different positions and provides features and adjustments with the ability to enhance the comfort, productivity, and overall well-being of the occupant. People are not all the same height. Therefore, your office chair must have a height adjustment. The specifications to adjust your office chair and to promote good posture are as follows: thighs should be horizontal to the ground while both feet are on the ground and wrists should be straight while typing. If you cannot find an office chair height that allows both of the above, you may want to find a way to alter the height of your keyboard so that you can have straight wrists while typing and your body is aligned properly with the chair and the floor. Trey Chair. A multifunctional wonder like no other chair that serves as a comfortable desk chair, but also a rocker with an extra seat for a friend, foot stool, laptop desk, or side table. See it HERE. Your chair must be stable. Your chair tipping over when you are in it is not funny. Serious and permanent injury can occur. Look for a chair on wheels that swivels and a five-point base that will not flip you over on your head when you recline. So, take time when you are out shopping for your new office furniture, take this article with you. Once you have decided on your new office chair, make sure it possesses all of the above features. 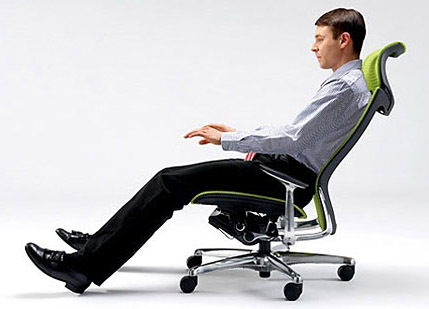 As mentioned earlier, a good office chair will improve posture and eliminate aches and pains. Question: I need to paint the inside of my house, but don’t want to use the traditional paints, which I know have many chemicals. Are there chemical-free alternatives? Response: Traditional household paints contain many chemicals, including volatile organic compounds (VOCs), which are a large group of carbon-based chemicals that are volatile, meaning that they like to exist as a gas. The type and amount of VOCs in a household paint generally varies with the type and brand of paint, but traditional household paints generally contain many VOCs, including benzene, formaldehyde, and toluene. Some of these VOCs have been linked in scientific studies to bad health outcomes, including eye, nose and throat irritation, nausea, headaches, and even cancer... Read More HERE. Ready for change? Take advantage of our Hourly Consultation on your paint color!